Of course, if you have a different sample player that can read one of the above formats, and most modern players will read at least one of them, you're all set. If in doubt, please contact us. * The NNXT will not find the samples when the instruments are loaded for the first time. You need to manually locate the samples on your drive. 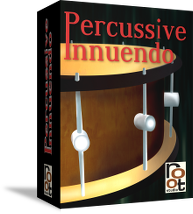 We plan to release Percussive Innuendo as a refill in the future which eliminates the problem. This will be a free upgrade.